Designed to facilitate regulator servicing, this precision machined holding bar features both low pressure 3/8" UNF and high pressure 7/16" UNF fittings, to fit standard regulator ports. 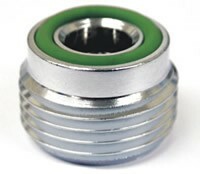 Can be used with hose adaptors to use with alternative thread types. This Pin "C" Spanner is a must for Reg Repairs for those 1st stages that use this type of fitting. 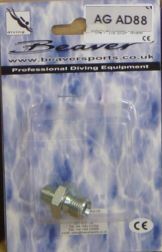 Manufactured using Beaver's renowned quality rust free marine grade stainless steel. This multi purpose tool with several sized spanners, screwdrivers & allen keys is purpose designed to suit most diving applications. Folds away tidily when not in use. 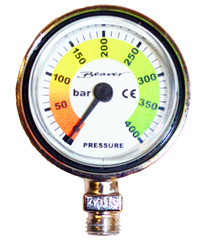 22 Bar intermediate pressure gauge for monitoring & checking regulator 1st stage output pressure & intermediate hose pressure between first & second stage. Suitable for use with all QD coupling hoses. For surface use only. 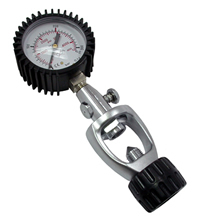 Manufactured from high grade 420 stainless steel & features 8 useful tools including O-Ring pick, Schrader valve adjuster, flat & Philips screwdrivers, 1/4", 3/16 & 5/32" Hex drives & slotted valve nut adjuster. All specifically designed making quick repairs to your diving equipment & also in & around the workshop. 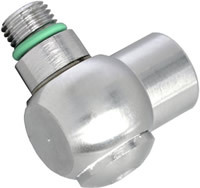 LP stainless 1/2" male to 3/8" female adaptor. Enabling use of a standard hose. Small, but oh so very important! 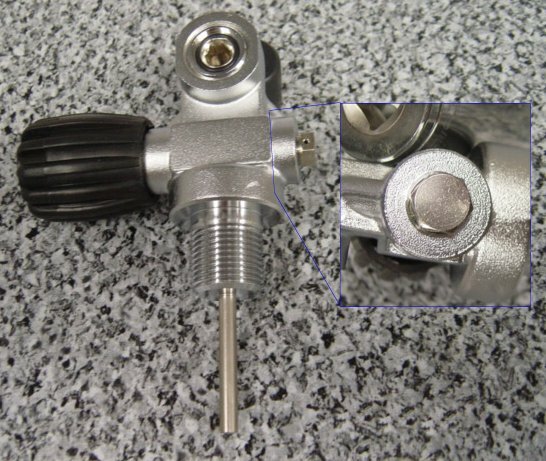 Allows charging of valves fitting the DIN 300 Bar connector by compressors with A-Clamp fitting hoses. For use to isolate a regulator 2nd stage in the event of free flow especially on regulators not designed for use in colder waters. 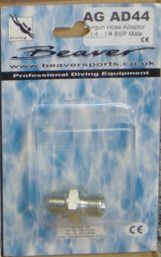 By fitting the a simple yet effective sliding action of the valve sleeve will manually isolate the free flowing regulator or octopus, allowing for a safe ascent. Suitable for fitting to hoses with a standard 9/16" UNF connection. 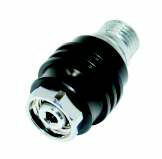 High pressure 7/16" UNF 90 degree hose adaptor with a single outlet. Ideal to keep your high pressure hoses tidy & also reduces the risk of kinking & bending. 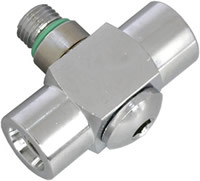 Converts 232 bar DIN outlet to 300 Bar DIN inlet, allowing the connection of a 300 Bar valve to 232 Bar on a 232 Bar fitting compressor hose. Compact stainless steel swivel allowing improved freedom of movement & comfort for your regulator & octopus. Fittings are 9/16" UNF to fit most regulator & octopus hoses. The regulator hose swivel also reduces the risk of twisting or kinking hoses. 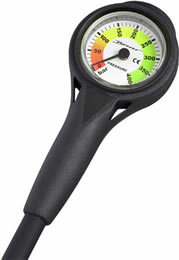 Stainless 300 bar 1st Stage button pressure gauge. 2.3cm diameter. 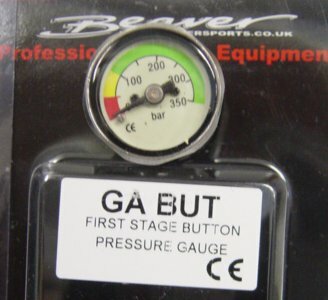 Suitable for pony and stage cylinders. M25 X 2 (metric) 232 bar tank valve with burst disc (inset). Complies with Australian Standards. 1/8" X 1/8" BSP male. For LP usage such as Air Gun or Hose adaptors. 1/4" X 1/8" BSP male. For LP usage such as Air Gun or Hose adaptors. 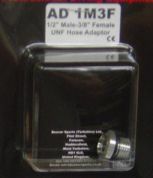 1/4" X 1/4" BSP male. For LP usage such as Air Gun or Hose adaptors. Cylinder Valve DIN insert to fit most Cylinder Valves & Manifolds with G5/8" 232 Bar DIN EN-144-3 type outlets. 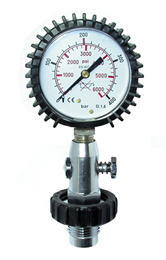 Simply converts any 232 Bar DIN fitting for use with an INT-A-Clamp type Regulator 1st Stage. Insert in to the DIN recess on a cylinder valve in seconds, tighten with a suitable 8mm Allen Key and easily removed to rapidly convert the cylinder valve back for use with DIN type threaded regulators. 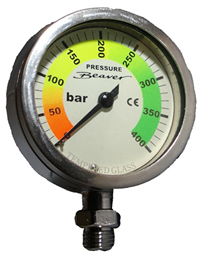 O-Rings are manufactured from supreme quality Viton for use with Nitrox - Oxygen enriched breathing air. 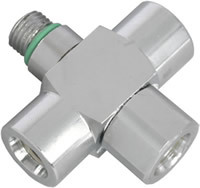 Perfect for use with 232 Bar Cylinder Valves as well as all other types with an EN-144-1 compatible gas outlet.